Bessimo is a Social Cooperative funded in 1976 in order to offer therapeutic rehabilitation programmes to drug-addicted people. We are a no-profit organization accredited by Lombardia Region for addictions treatment since 2008. We care about addictions from Prevention to Harm Reduction: 222 people are employed in our Organization. As a social cooperative, Bessimo is based on member social participation and cooperation: our social assembly is composed by 105 members. Bessimo is a Social Cooperative funded in 1976 in order to offer therapeutic rehabilitation programmes to drug-addicted people. We have been a no-profit organization accredited by Lombardia Region for addictions treatment since 2008. As a social cooperative, Bessimo is based on member social participation and cooperation: our social assembly is composed of 105 members. “The Acrobats” Consortium (http://www.smigliacrobati.it/) which operates an outpatient service for people who suffer from problematic use/abuse in gambling, internet, psycho-active legal or illegal substances, in the province of Brescia. “Prison and Territory Association” (ASSOCIAZIONE CARCERE & TERRITORIO – http://www.act-bs.it/) engaged in activities raising awareness of the issue of detention and in promoting alternative measures to prison detention. Extra-EU citizens, as long as they have a residence permit. Non-EU residents detained without a residence permit under probation measures. People who are under any limitation of their freedom. If you are a non-Italian speaking visitor and you would like to contact us or find out more about Bessimo Social Cooperative, you can send an e-mail to Elisa Arcari at prevenzione2@bessimo.it. Bessimo Social Cooperative helps people suffering from other forms of addiction including alcohol, gambling and the Internet. We care about addictions from Prevention to Harm Reduction. • 14 residential therapeutic communities: Therapeutic Rehabilitation, Orientation, and Specific Treatments for families, alcohol-addiction and multiple addiction. It can also offer an alternative to prison, such as external criminal enforcement corrective measure. We offer an amount of 265 credited seats. 2 Support Services for inmates in Brescia Prisons. Bessimo Social Cooperative is based in Lombardy, a region in northern Italy. Our first step was taken in the province of Bergamo, in the small town of Bessimo in 1976. 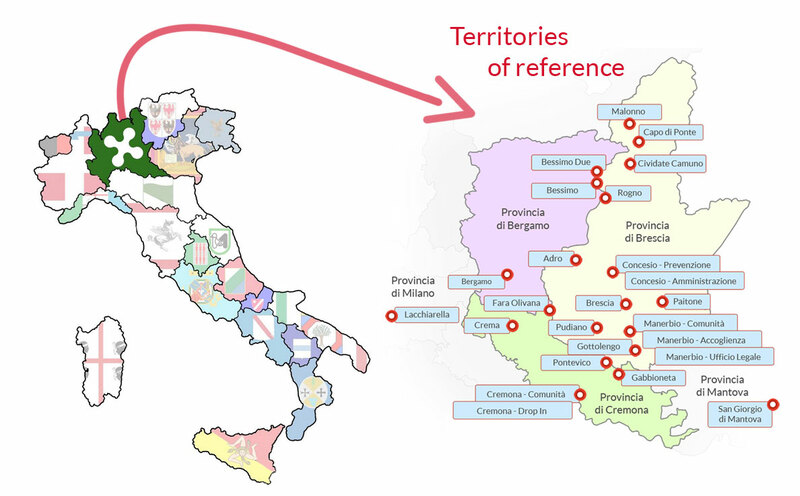 Nowadays, we work in four Lombardy provinces: Brescia, Bergamo, Cremona and Mantua. Our Welcome Service is based in Manerbio (25 kms from the city of Brescia). This Office is dedicated to people who wish to take on a recovery programme in one of our Centres. We have been operating since 1976, the year in which our first residential therapeutic centre was opened. Our Residential Communities are open 24/7, 12 months per year. According to certification standards, we guarantee the stable presence of graduated personnel. Our Administrative Offices are open from Monday to Friday from 9.00 am to 6.00 pm. Our Support Service for inmates guarantees a weekly presence in the Brescia Prisons. The Cooperative has no profit aim; its goal is the pursuit of the general interest of the community, human promotion and the social integration of citizens. The Cooperative is inspired by the bases of cooperative movement basis: mutuality, solidarity, democracy, commitment; and furthermore, the balance of responsibilities with respect to roles, the community spirit, the link with the territory, a balanced relationship with the state and public institutions. The Cooperative meets its social goals through the management of health and educational services oriented primarily, but not exclusively, to the needs of people with problems of addiction. In relation to this, the Cooperative can manage permanently or temporarily, either on its own or on behalf of third parties: socio-educational or assistance services but also productive activities only with a therapeutic and educational value. 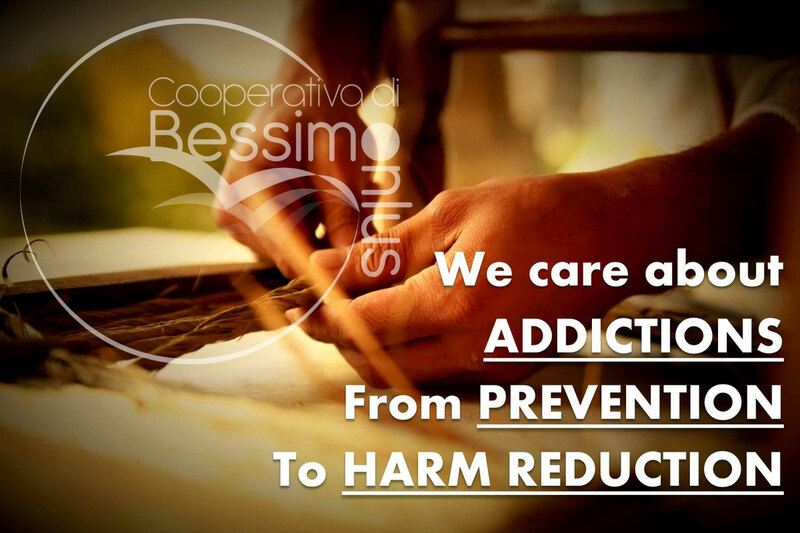 All Bessimo Cooperative activities depend on our Ethical Code edited and shared by all associates. Its main principles are: transparency, clarity, honesty, fairness and impartiality. According to our last Balance Sheet, the staff who provided services during the year 2016 consisted of 222 people: 54 males (24%) and 168 females 76%), volunteers excluded. Bessimo Social Cooperative Staff Members are all selected through interviews and aptitude tests followed by a permanent training path. 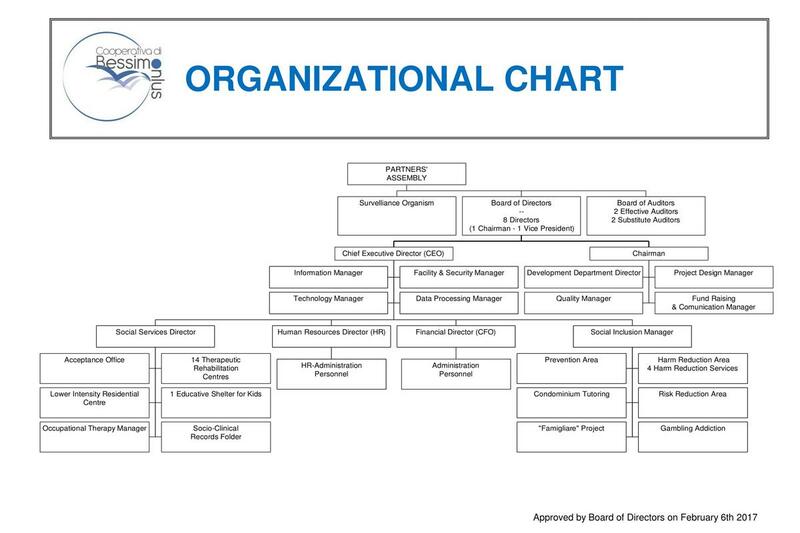 All employees are supervised on a quarterly basis. We also avail of the help of many professional consultant as Physicians, Psychologists, Psychiatrists, Cultural Mediators, Health Care Assistants and Lawyers. Last but not least, we would not be able to operate without the help of our volunteers. Bessimo Social Cooperative has owned a UNI EN ISO 9001 EA 38F Quality Control Certification since 2008. We have been Validated by Regione Lombardia as a managing organization for addiction rehabilitation programmes. As well as a Validated Organization, Bessimo Social Cooperative follows Regional and National Addiction Guidelines provided by the Social Health National System. We recognize Addiction as a Chronic Relapsing Disease, whose main symptoms are Tolerance, Abstinence and Craving. Our Rehabilitation programmes are drug-free and offer a comprehensive range of services which seek to help the individual detoxification, recover, and build a new life for themselves in which they participate in society productively and on equal terms. relapse prevention strategies and reintegration into society. People interested in a Rehabilitation Programme can access through the Social Health National System Services (NOA, SMI, SerD…). “Prison and Territory Association” (ASSOCIAZIONE CARCERE & TERRITORIO – http://www.act-bs.it/ )engaged in activities raising awareness of the issue of detention and in promoting alternative measures to prison detention. As a Social Cooperative, Bessimo is based on the democratic participation of its partners. Our partners’ meeting gathers at last twice a year and elects its Board of Directors (and President) every three years.